Providing positioning with great precision and reliability, Galileo is the named identity for Europe's civil global satellite navigation system—the program is funded and owned by the European Union, with overall responsibility for management and implementation held by the European Commission. This nexgen of systems and the technical development of infrastructure are entrusted to the European Space Agency (ESA), and the Galileo spacecraft bus is built by OHB System in Bremen, Germany, with the navigation payloads provided by Surrey Satellite Technology (SSTL) in the United Kingdom. 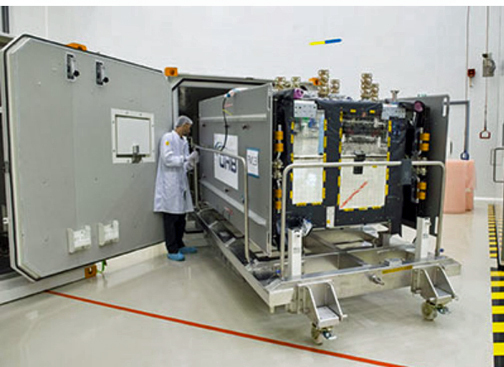 One of the four Galileo satellites for Flight VA233 is removed from its protective shipping container during activity inside the Spaceport’s S5 preparation facility. These Galileo navigation satellites are to be launched Arianespace and their processing has been initiated at the Spaceport in preparation for a November liftoff from French Guiana. This milestone mission—designated Flight VA233 in Arianespace's launcher family numbering system—follows the company's previous launches of Galileo spacecraft in pairs aboard medium-lift Soyuz vehicles. Flight VA233 is to use an Ariane 5 ES version of the heavy-lift workhorse equipped with a storable propellant upper stage. The vehicle will deploy the satellite passengers at a targeted orbit altitude of 23,222 km. All four spacecraft were delivered this week by a chartered Boeing 747 cargo jetliner, which touched down at Félix Eboué Airport near Cayenne. They were transported by road to the Spaceport's S5 payload processing facility. To date, 14 Galileo satellites have been orbited by Arianespace Soyuz launchers on seven missions from French Guiana. With the inaugural Ariane 5 launch, this number will increase to 18. When complete, the Galileo system will consist of 24 operational satellites, along with the ground infrastructure for the provision of positioning, navigation and timing services.